Water Technics can offer fibre glass relining for all sorts of applications. For example we can reline an old tiled swimming pool, old fibre glass pool. In some instance we can reline an old liner pool (as long as the walls/floor are solid and stable. We can also reline old balance tanks, problem area in an overflow channel – the list goes on. Fibre glass has a number of unique benefits over painting and using a vinyl liner. Firstly cost…it cost a lot less to fibre glass a swimming pool rather than re tile. Secondly you have a wide choice of colour. Almost any RAL can be chosen. We can also mix the gel coat on site to suite your taste. Thirdly, speed the complete pool can be reline in under 1 week. The drying times are also a lot less than that of tile adhesive (2 week) and grout (1-2 weeks). If you have an old tile pool that has always leaked then this could be the answer for you. The fibre glass technicians will make sure your drain pots are lapped over to ensure a good water proof seal. Adds strength to your pool's construction. Fibreglass has its own flexible strength. That's why it's used in aircraft and yacht construction. So fibreglass will certainly add stability and strength to your swimming pool's structure. This added bonus would help reduce or prevent problems caused by seasonal earth movements and invasive root growth. Tiled or coated concrete pools and PVC liner pools don't have this additional strength built in. Seamless and safely smooth surface. The top gel coat of a fibreglass liner produces a hardwearing, smooth, abrasion safe finish. You don't have to put up with grazed and sore limbs and feet that are often suffered with tiled pools. The non-porous top surface of fibreglass means you won't have the 'tide marks' that plague PVC liner pools. 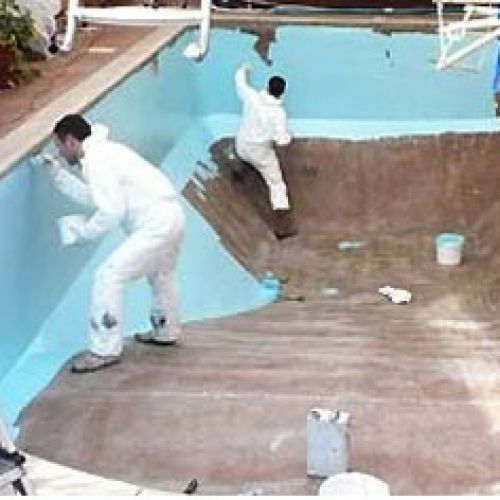 When swimmers sensibly use sun tan and uv barrier creams and lotions it will eventually lead to unsightly hard to get rid of stains at the water levels of PVC liner pools. So for a great tan and great looking pool go for fibrglass every time! Higher life expectancy, lowest refurbishment and maintenance costs.Over the lifetime of your fibreglass pool the likelihood of you needing to drain it is minimal. However with a PVC liner pool you will need to replace the liner every 5 to 7 years. Similarly, a concrete pool will need to be regularly drained and acid washed. And a tiled pool has the disadvantage of eventually needing regrouting. The tiling grout will only withstand chlorine immersion for so long before its erosion will lead to your pool leaking. So, in terms of convenience and true costs a fibreglass lined pool wins out in the long haul. Compatible with all types of pool water treatment systems. Any standard or not so standard water treatment system you have installed or plan to have will work well with a fibreglass liner; including chlorine, salt chlorinator, fresh water and ozone systems. Please contact us if you have any question, require a quotation or advise on any swimming pool tiles for the shell or surround. We are happy to help. Call us on 0800 246 5879 or email sales@watertechnics.co.uk.